Try this finishing-move sequence that'll bring up your rear delts in just two weeks. I&apos;m a stoic in the gym. I rarely smile. Very little bothers me...except overweight guys in tight-fitting Spandex...and country music when I&apos;m training...and too much jabbering between sets. Did I mention guys who don&apos;t use deodorant? Nothing bothers me more, though, than seeing a guy walk into the gym with a stringer tank top draped over hunched shoulders. While this may appear impressive to some folks, to me it&apos;s a clear indication of someone who spends too much time training chest, and too little time focusing on what they can&apos;t see in the mirror. The guy needs some support to pull those shoulders back and bring his chest out like a proud silverback gorilla. This man needs to spend a little bit of his iron-loving time on rear delts. Operation Pumpkinhead needs to be put into full effect immediately! The goal: Round out those shoulders and create the illusion of a masterfully carved stone statue. The best way to do it is with this finishing sequence! You have neglected your rear delts for too long, and now it&apos;s time to pay. Do this finishing movement (tag it on to the end of your workout) three—yes three!—times per week for two weeks with at least 48 hours rest between workouts. In just two weeks you should see some real lumps coming out of the backside of your shoulders. I know I just blew up your entire gym existence with such a high frequency demand, but it&apos;s time to shake things up. "Grab someone as sadistic as you, an incline bench, and a set of dumbbells. Then get it on and get it over with." This is best done at the end of shoulders, chest and, back workouts, but you have to arrange your split so you don&apos;t do them on consecutive days. Because repair and growth take place when you&apos;re not in the gym, insert rest or lower-body days in between, so long as your upper body isn&apos;t involved. Grab someone as sadistic as you, an incline bench, and a set of dumbbells. It&apos;ll probably take a few times to get the weight right so don&apos;t get discouraged. Your goal is to do a set of 10 reps (to failure) and two additional forced reps with help from your partner on each of the three continuous movements. The three exercises are done as a tri-set, meaning you go from one movement to the next without resting. 1. Set the incline bench to about 45 degrees. 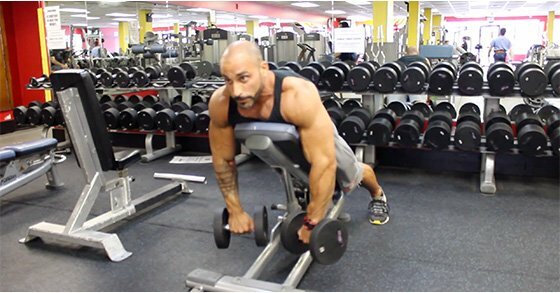 Position yourself with your chest on the pad as if you were doing T-bar rows. Your head and neck should be above the bench so that you can look straight ahead. Once you&apos;re in position, have your partner hand you the weights. 2. On the first movement, raise the dumbbells forward and out about 45 degrees to your sides with your pinkies leading the way up. (Because you&apos;re leaning forward, this still hits the rear delts.) Concentrate on trying to get your pinkies to touch the ceiling. You should hit failure by the 10th rep, with your partner assisting you on the last two. 3. Without resting, go directly into the second movement. 4. With the same weights in hand, raise the dumbbells straight out to your sides, again with your pinkies leading the way. Visualize throwing the dumbbells out to your sides again for 10 reps; finish with two forced reps with some help from your training partner. 5. You may start to feel fire but you&apos;re not done. The third movement is a multi-joint row, which brings in the lats to assist those burning rear delts. Let the dumbbells hang straight down and turn your pinkies forward about 45 degrees. Row them up so your elbows go past the level of your ears, keeping your elbows out to your sides. Rep till failure, then perform five more. And no bitching and moaning about how you can&apos;t do another rep! 6. Switch with your partner and repeat for a total of three sets. Rest only as long as it takes your partner to get into position on the bench. Get it on and get it over with. Watch the short video here if you&apos;ve got any questions on execution. Once you&apos;ve completed all three sets, check the mirror to see those giant lumps on the back of your shoulders you never knew existed. You&apos;re now ready to be carved like a jack o&apos; lantern on All Hallow&apos;s Eve!! 1. Do all three exercises without changing weights or resting between sets. Rest only after you complete all three moves. 2. Rear-delt exercises like supported bent-over lateral raises require that you keep your arms locked in the slightly bent position for the duration of the set. You don&apos;t want to open up and close at the elbows during execution. 3. The last exercise of the tri-set, the row, is a multi-joint movement; hence it requires movement at both the shoulder and elbow joints. Most rowing movements, if you didn&apos;t know, work the rear delts in addition to the lats. Ask The Siege: How Can I Fix My Desk Jockey Belly? It&apos;s too easy to get sucked into the daily desk job grind and forget all about your health and longevity. Here&apos;s the Siege&apos;s plan to help you get rid of your desk-jockey belly and increase your energy and vitality! Ask The Siege: How Can My Training Be More Efficient? Get better results and spend less time in the gym! Increase the intensity, frequency, and effectiveness of your work and you&apos;ll be able to do more, faster. Ask The Siege: How Do I Improve My Strength And Aesthetics? Too many people worry about how they look in the mirror and don&apos;t pay enough attention to their performance. Learn how to train for aesthetics and strength.